Fresh out the oven – Big Z Remixes just released his new mixtape, Can’t Get Enough. Get it while it’s hot! Never thought I’d be posting Britney Spears on Sunset. Then again, never thought I’d be writing on Sunset in the first place. Whoo! Anyways, I’m a huge Big Z Remixes fan. His hip-hop remixes are ultra dope and right up my alley, and I love them all. This is, I think, his first electronic remix, so have a listen. I’m looking forward to more from him. Two Big Z songs in less than 24 hours on Sunset? I love it. This one features a Sunset favorite, Fortune Family, it has a really mellow vibe to it, and Big Z made an interesting decision to switch up the order of the verses, dropping Oncue’s first, Hop’s verse 2nd, and then Reef’s verse. With a nice introductory piano riff followed by some bass and a great horn section, Big Z puts a really unique twist on this one and it sounds great. This has gotta be up there with my ‘Slow Down’ and ‘We Major’ as my favorite Big Z Remixes remixes. Lydia says remixes are like PB&J sandwiches: I’ll make a different metaphor. Remixes are like that moment when you were a little kid and had multitudes of ice cream flavors lined up in front of you along with a smorgasbord of toppings. You want some cookie dough? Toss that in there. Cookies and cream? Do it big. Chocolate sauce? Yup. Sprinkles? Yes. Rainbow sprinkles? Chocolate sprinkles? Hell, all of the sprinkles, toss ‘em on there. Now imagine that the acapella from the original is vanilla ice cream. Sure, tasty in its own right, absolutely. Well, this is a damn good ice cream sundae from Big Z. Enjoy. Be sure to like Big Z Remixes’ BRAND NEW FACEBOOK FANPAGE. Do it. We’ve been holding down Zach Caraher, aka Big Z Remixes, on Sunset in the Rearview since day one. We first heard from Big Z back in February of 2010 when he sent us the song “Blue Magic” and immediately knew this guy was for real. We’ve followed his progress since then, which eventually led to an exclusive release of his mixtape Slow Down. Today, we’re eagerly awaiting March 15th, when he will be dropping his new mixtape, Never Change. Yesterday, Big Z released a new single off of the upcoming album, a remix of Kanye and Common’s classic “Get ‘Em High.” Ratatat did a great version as well, and Big Z really puts a unique twist on this acapella, and I am a big fan of his version. I’m extremely excited for ‘Never Change’ to drop in just under two weeks, and you all should be too. Big Z never disappoints. So Big Z has some good news-his new mixtape “Never Change” will drop on March 15th. I’ve been a huge Big Z fan since I first hear him: he has a unique ability to take hip-hop acapellas and turn them into something completely new. Often, he can take a great rap acapella and turn it into easy listening music, such as “Slow Down” with Lupe Fiasco. Other times, he can turn mean acapellas into even meaner songs, such as “We Major” with Kanye West. Any way you look at it, Zach Caraher aka Big Z is a really talented producer with a unique, on point style. I always get excited to hear new material from him, and he certainly delivers with this Jay-Z remix. Get excited for his album, it will be great, no doubt about it. Also, great artwork from Adam Kalilula, a great artist in his own right. Sunset in the Rearview was recently listed as one of the Top 100 Indie Music Blogs on the internet, and when I was asked to answer a few questions about why people should listen to independent music, I mentioned the creativity that the indie scene allows. What I forgot to mention in this regard, though, is how entrepreneurial the independent music scene is. There are opportunities every day in the indie world that, through campaigns born from creativity, allow for your everyday person to go knocking on the door of some serious tastemakers in music. Here’s a perfect example of that. Asher Roth recently put up an acapella on his Facebook page, calling for any producer who wishes to participate to make an original beat for the song. The chosen winner than gets to be on Asher’s next project. That’s pretty incredible, if you think about it. 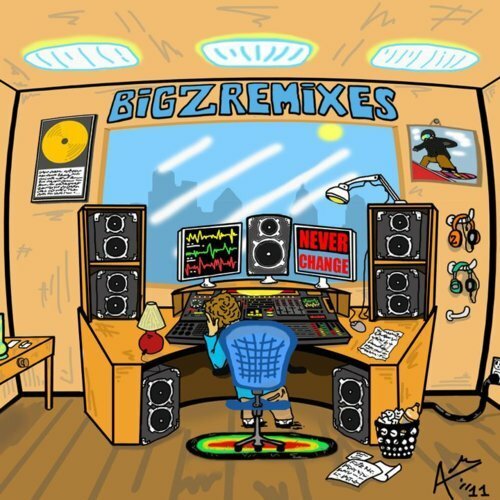 To no surprise of mine, Big Z Remixes has submitted a beat. 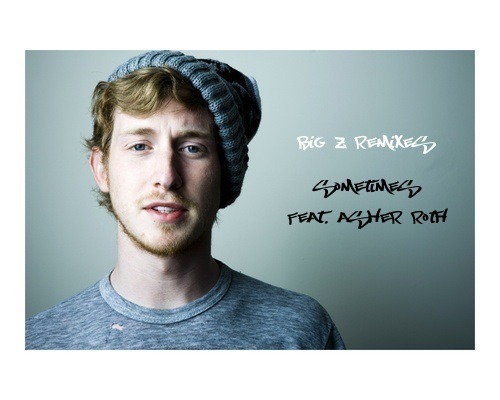 This song carries the typical low-key vibe that Big Z has claimed as his own, and it sounds quite nice under Asher’s lyricism. The sample is “Sometime” by The Noisettes. The one thing I wish for from Big Z is a bit more variety, but I’ll say – this kid is young. He’s got the whole world ahead of him. So much time, so much room to explore. I’m just anxious to see that happen. 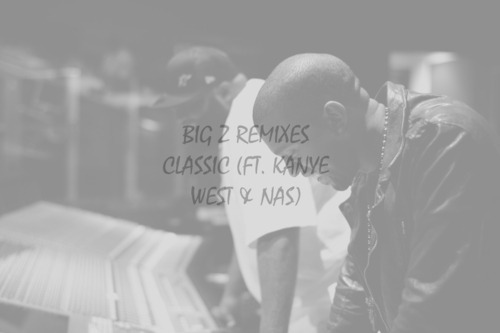 Big Z Remixes is back with…yet again…another wonderful track. I cannot get enough of this kid’s music. It blows my mind every time that he’s just a high schooler, challenging the big dogs like Kanye and Nas and turning their music into something totally different and often times more enjoyable than the original. Big Z needs to become a producer. In fact, G.O.O.D. Music needs to sign Big Z. That’s what really needs to happen, huh? Have you ever found an amazing pair of jeans…only to realize that these gems might just look better as jorts? So you proceeded to cut them up, putting your own style into them, perhaps fraying the edges just as you’d like them to look. And somehow, they come out perfectly. The originals were awesome, but you created a beautiful new look that others can only manage to stop and notice. Like, ‘Damn, I gotta get me some of those.’ Your handmade jorts are THAT great. Alright, so maybe not all of us can relate to this. This is coming from a girl’s perspective, and unless you live in Cali or are a hipster dude, you might not get the reference. So if you haven’t had that experience, it’s okay. But don’t lose hope! It may someday come to be! For now, though, I’ve got the perfect alternative. I, as part of Sunset in the Rearview, hereby present to you: Big Z Remixes. Just like that perfect pair of jeans-turned-jorts, Big Z has taken a collection of masterful hip hop in his new album, Slow Down, cut it up, put his own spin on it, and sure enough, created a tour de force in its own. After falling in love with his past work, I wasn’t sure Big Z’s sound could get much better. But sure enough, in the time he took off to create the latest album, Big Z went back to the drawing board and took an exacto knife to the edges, adding touches of genius production and gentle instrumentals to an already fine-tuned sound, and he ended up with a miraculous piece of art. If the artists on this album (who include Tupac, Kurupt, Lupe Fiasco, Wiz Khalifa, Kanye West, Nas and more) could hear how Big Z has combined their vocals with his melodious instrumentals, I have a strong feeling that they would first do a dubious and quick double-take, but soon after would be pleasantly surprised at just how good they sound on these new tracks. So alas—all pregamers, stoners, hipsters, gym-rats, hoodrats, eager listeners seeking to find the appeal of hip hop, and kids stuck in the library wishing that rap music wasn’t so damn hard to study to: we can at last unite! The day has come when all of preferred styles have been paired and tailored to match. So whether you prefer jorts, sweatpants, leggings, gym-shorts, or maybe ripped up cargo-pants, we’re in for good luck, for it seems this right here is one-size-fits-all.